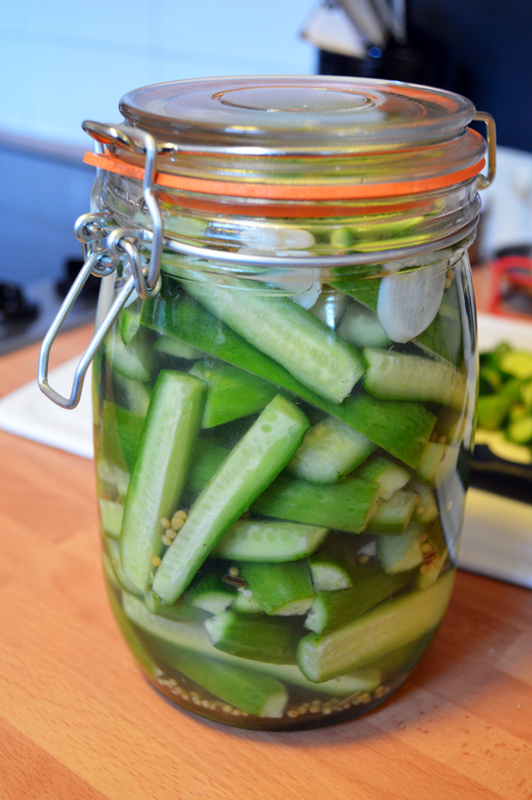 Recipe - Easy Homemade Pickled Gherkins - Sugar, Darling? So they may not be everyone's cup of tea, but Pete and I adore pickled gherkins. On burgers, in sandwiches, mixed into potato salad or eaten right out of the jar (don't judge me) gherkins really are my pickle of choice. I've wanted to make my own for such a long time, but had never seen the itty bitty little cucumbers needed - until now! I think I got a little too excited when I was walking through my local Tesco and saw these adorable 'Cute Cues' by Fresh & Naked. I immediately grabbed three bags and ran back to the cookware section to find a glass clip top jar to pickle them in. It may seem crazy to some to bother making these yourself as they're so readily available already, but you should definitely give it a go - they are so much crisper and fresher tasting than the store bought version. Next time I won't forget to but dill and add some of that, but these were great even without that. We ate most of this jar last Saturday night when we visited my Mum and Dad for dinner - it was a bit of a crazy coincidence as my Dad had made some amazing fresh corned beef which of course goes perfectly with gherkins! He also did an amazing brown rice, cauliflower and blue cheese gratin - lordy was that good! 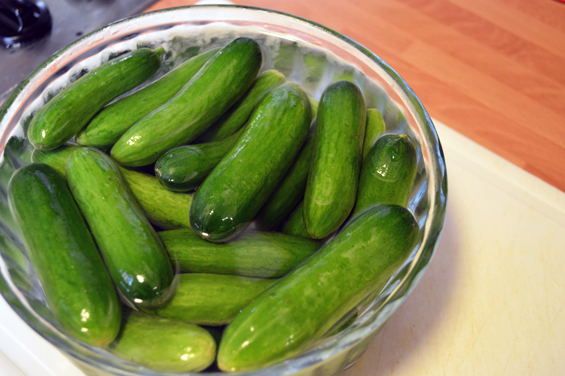 The night before you will be jarring the gherkins, wash your little cucumbers and put them into a large bowl. Cover with cold water, throw in some ice cubes and cover with cling film then pop in the fridge overnight until you need to use them the next day. Sterilise your jar(s) by either running them through a really hot dishwasher or boiling them for 10 minutes on the stovetop. Let them airdry on the draining board - don't dry them with a towel! 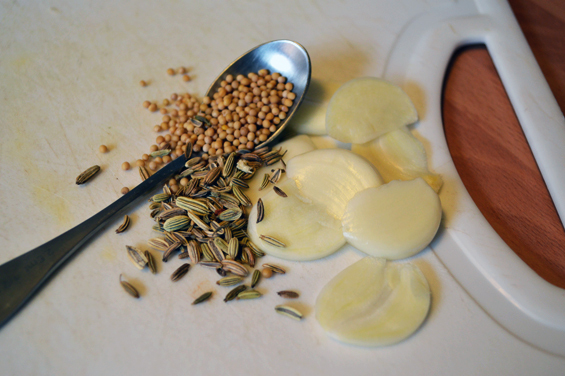 When you're ready to do your jarring pour the vinegar, water and sea salt into a big saucepan and bring to the boil before adding the sugar, sliced garlic cloves, mustard seeds and fennel seeds. Continue boiling for 5 minutes and then take off the heat and set aside. While the liquid is cooling drain your chilled cucumbers then cut off the tops and bottoms and slice into whatever shape you would like - I did spears but you could do long slices, coins, angled slices or whatever you fancy. Flatter shapes go better in a sammich. Start putting your cucumber slices into the sterilised jar, layering it with the fresh dill fronds if you're using them, then poor over the vinegar water mix. Don't forget to get the seeds and garlic slices into the jar too! Seal it up well and pop it into the fridge to pickle - it's a good idea to label the jars with the date they can be eaten from (at least a week from jarring) and the date they should be eaten by (a month after jarring).